Taken around about 1909, it shows (from left to right) William John Crossfield (bn 1836), William Dickson Alfonso Crossfield (the child, bn 1907), William James Crossfield (bn 1886) and William James Crossfield (bn 1865). 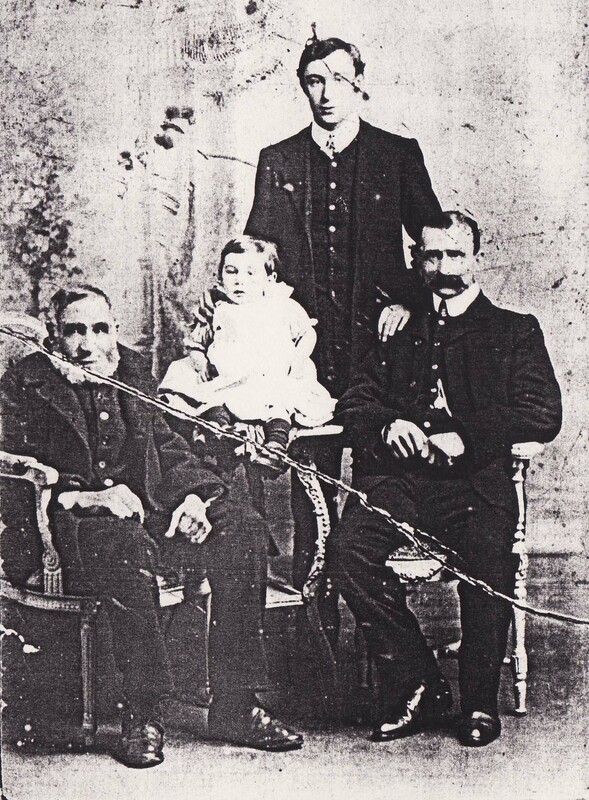 This poor copy of an excellent photograph (sadly the only copy I have) shows four generations of William Crossfields. The Crossfield family were resident in Brighton from at least 1800 and on into the 1960’s. Indeed there may still be some around in Brighton that I’m yet to track down! The baby in the group, William Dickson Alfonso, went on to serve in the Royal Army Service Corps in the Middle east during WWII and is the William Crossfield mentioned in the article: The Crossfield Family in WWII. His father, standing at the rear of the picture, William James, served in the Royal Engineers during WWI and worked as an electrician in Brighton throughout WWII. His nickname was “Fuss”, as he would constantly fuss over looking after his enormous brood of twelve children and numerous grand-children. All eight of his sons saw service during WWII and his fussing obviously worked, as they all returned home safely. Seated on the right of the picture is William James senior. He lived in Brighton all his life, initially apprenticing as a blacksmith, but later working as a whitesmith (working with predominantly tin & pewter). He himself was father to seven children, and wearer of a most excellent moustache as you can see! To the left of the photo is the wonderful old figure of William John Crossfield. At the time of this picture he was around seventy two years of age. Born in Brighton in 1836, he spent much of his younger years serving in the Royal Navy, including serving aboard HMS Odin, in the second Opium War in China. Two of William’s four brothers went on to very different careers in the hotel industry, and can both be found working as porters on the 1861 census at Claridges Hotel in London. William himself appears on the same census actually aboard HMS Odin in the China sea. When he left the navy in 1863 William returned to Brighton where he raised his family whilst working as a sailmaker and a fisherman. Sadly, William John died in The Elm Grove Workhouse Infirmary in 1914, just weeks before it was cleared for use by colonial troops as a hospital during WWI. This has always been particularly poigniant for me, as it was the same building in which I (his 3 x Great-Grandson) was born in 1966, by which time it had of course become Brighton General Hospital. The Crossfield family always lived in and around the Islingword Road, Elm Grove, Queens Park Road triangle, indeed, with that many of them around there cannot have been too many streets in the area without it’s own Crossfield resident. Hi Steve, you may already be aware of this but there is a facility on rootschat.com where very kind volunteers will really smarten up any old photo that you post on that forum and make a really good job of it too. Well worthwhile to have a really good copy I feel. Thanks Dave, I’ll look into it. Hi Steve, I expect that somewhere down the line we are related, as my dad is also a William Crossfield (one of my middle names too!) and I think his dad is the baby on the table. He’s just moved back down into Sussex after spending years in London.